Not too hot and not too cold; many of the plants we grow are just like us and prefer similar temperatures — between 65 to 85 degrees Fahrenheit. Also, like us, they hate extreme temperatures changes. Plants will temporarily stress out when adjusting to them. Controlling temperatures is one of the single most important aspects of growing. If you fail to do so, you will wreck your plants nutrient uptake and weaken them to diseases before they eventually die. How about I show you how to avoid this? Let's take a look at some common grow tent heat problems, and how to remove this heat from your grow tent or grow room. A thermometer and hygrometer are essential to every indoor garden. Locking your plants into their preferred temperature and humidity ranges is crucial for nutrient uptake. If your vapor pressure deficit (VPD) is off (air temp + leaf temp + relative humidity), then your plants will either drink and uptake too much or not enough nutrients. It’s common to see calcium deficiencies because transpiration is largely affected. If this happens, you can use a cal-mag supplement. But you will need to address the root cause eventually as well. Let’s say you’re feeding 250 ppm or .5 EC of nutrients a day, but your VPD is too low so your plant isn’t drinking much from its grow media and you start seeing deficiencies. So you raise nutrients to 300 ppm to combat this. However, if you had just raised your temperatures, lowering your humidity, your plant would have started drinking more water from it’s media, and could have stayed at 250 ppm saving money on nutrients. Dual thermometer and hygrometer units are very affordable, and they will end up saving you money and eliminating a host of potential problems. Temperature directly affects humidity levels and when they are off, you open yourself up to a domino effect of one problem after another problem. This brings up an important lesson. Unless, you can always get to your grow tent, any time of day, start automating environmental factors as much as possible. Get a controller that automates your lights schedule, temps, humidity, and adjusts your ventilation system so your VPD is always perfect. You could purchase each of these individually, or make your life easy with a multi-function grow room controller. This will control all aspects of your grow room with the same controller. Your grow lighting system is going to be the largest contributor to your grow tent’s temperature, and if you find yourself struggling with temperature issues, you need to look at your lighting system first. 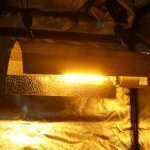 All lighting systems have unique ways they affect your grow room’s temperature. To successfully control temperatures, you need to know how your lights do this. What you need to know: To spare you a headache, know that for the most part, more watts equals more heat regardless of what light is producing the watt. Remember this rule: Watts in = Watts out. A 600 watt LED at the wall, will generate around the same amount of heat as a 600 watt HID. Watts does not mean the amount of light produced. For the most part, LEDs and CMH are considered to produce less heat because you need fewer watts to match the amount of light an HID produces — they’re more efficient. You can take a 600W LED, a 600W HID, and a 600W electric heater, place them into individual insulated boxes and get similar temperature readings off each box. The heater watts are converted into thermal energy, while the watts from the lights are converted into thermal and light energy combined. One watt from any light will produce around 4 British Thermal Units (BTUs). Things like heat distribution, spectrum of light, use of a reflector, angle the light is produced in, etc. will create slight discrepancies in the way you grow tent is heated up, and the best growers know how to take advantage of these factors. They give you some of the best looking, highest yielding, and tastiest plants, but everyone agrees that their one big downfall is the heat they generate. If you’re using HID lighting like high pressure sodium or metal halide bulbs, you need to prepare for ways to decrease temperatures. Air-Cooled Reflectors are a godsend for HIDs bulbs — this is one of the ways different lighting system can be taken advantage of. 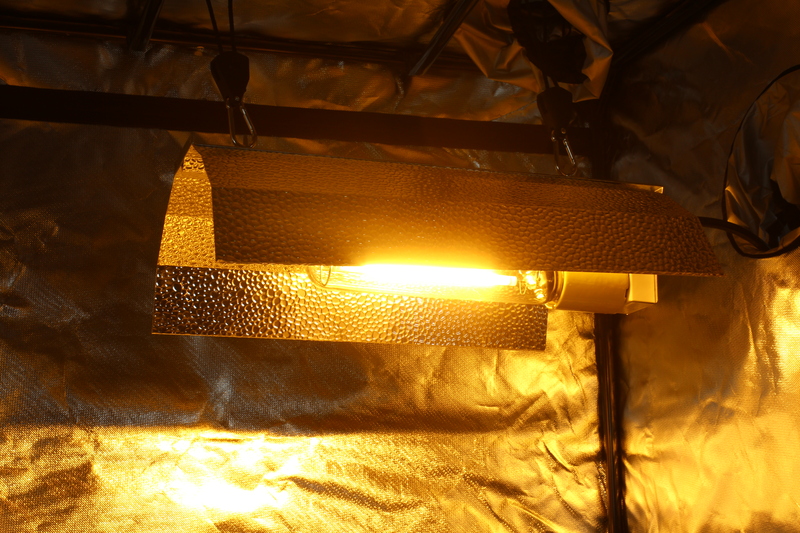 CMH can match HPS and MH light output with about 60-70% the amount of watts, and this equals a lot less heat. Most indoor gardeners agree that CHM are currently the best lights. CMH or LEC grow lights will give you the highest quality fruits, vegetables, and flowers. LED has proven they’re here to stay and the best ones are reducing your grow tent's heat by at least 40% compared to an HID of equivalent wattage. 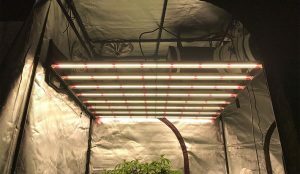 Most LED users fight will low temperatures during propagation and early veg, as LEDs have to be hung at least far from the plant's canopy as HIDs. You can run lower wattage LEDs in your grow tent for several reasons. The biggest reason is LEDs produce light in a 120-degree angle directly hitting your canopy unlike the 360-degree angle HIDs and fluorescents which has to be redirected affecting its efficiency. The best LEDs will give you the most lumens/light for the least amount of watts, and this is why they are the “coolest” grow lights currently out there. Fluorescents are cheap and just so simple to use. They don’t produce an incredible amount of heat by themselves, but the more you add, the faster you temps can get away from you. A small oscillating fan running through them is always a great idea. And while watt in equals watt out, you can reduce temperatures by taking advantage of CFLs by spacing them out since you are working with multiple bulbs instead of one. It seems like the majority of indoor gardeners struggle with high temperature, so let’s look at ways you can decrease your temperature. If high temperatures are wrecking your indoor garden, there is no better way to quickly bring the temperature down than an air conditioner. You can easily place them either in the grow tent or some models allow you to have them outside the tent while ducting the cool air in. For more information on air conditioners, read our guide on choosing and sizing the best one for your growing space. Many hydroponic setups keep the reservoir outside of the tent as dangerous algae can grow in the water when the temperature rises above 70 degrees. However, if you’re using a Deep Water Culture (DWC) system then this means your plants' roots are directly sitting in the reservoir, so it will be in the tent. Reservoir chillers are crucial in DWC and other hydro setups. Hurricane EcoPlus Stand Fan, 16"
Sometimes, all we need to do is lower our temperatures only a little bit, so here are my favorite life hacks for lowering temperatures without having to spend any money. Run your lights at night — This one can also save you money as well, as some power companies have lower nighttime electricity rates. Remember to watch for light leaking into your grow tent as this can cause serious damage to plants in flowering. Most flowering plants need a minimum of 12 hours of uninterrupted darkness. Change light schedule — Many growers are seeing great results running their plants under 18, 20, and even 24 hours of light a day when in the vegetative growth stage. However, the 16/8 light schedule is a classic for a reason. While running your lights longer may increase yields, you may end up hurting yields if your temperatures get too high from the extra hours of light. Plan your grows according to season — Most plants can tolerate at least 10-15 degrees more heat when they are in veg compared to when they are flowering, but flowering plants want more light causing a catch-22. If you’re fighting heat in flowering, try germinating in mid-late summer so the plant is flowering in the winter. Fans lying around the house — Sometimes all you need to do is get stagnant air moving around in your tent. Most people have a small fan or two lying around in their house. Changing Where You Grow — Heat rises, and if you live in a two-story home and/or have a basement, then you’ll notice a large difference in temperatures when moving through the house. I can reduce my grow tent’s temperature by over 10 degrees simply by moving it from the upstairs to the basement. Ducting in cool air from your AC unit is a great way to keep your tent cool without cluttering it up by placing an AC unit in the tent— that’s just taking away plant space. When purchasing ducting, you can either buy insulated or uninsulated ducting. Insulated ducting will prevent both cool and hot air from escaping while uninsulated ducting acts more like a radiator. This means hot air can escape and move back into the grow tent when exhausting it, as well, it means cool air may escape the ducting before it can reach the tent. The one negative of insulated ducting is it's much stiffer, but this isn’t necessarily a negative in this gardener's eyes. The more you bend your ducting, the more resistance you create and this weakens air flow. This translates into you using bigger and louder fans to compensate. The rigid nature of insulated ducting helps prevent this. If I could only use one supplement other than my base nutrients, it would be silica. Silica translates into hardier plants that can fight diseases, pests, and handle extreme temperatures better. I wouldn't grow without it to be honest. We often get caught up in only monitoring our daytime temps and completely forget about our temps at night, but this can spell smaller plants, reduced yields, and even dead plants. With high intensity lights, we get a lot of heat so we set up strong ventilation systems, but if we don’t turn them off at night we might create cold temperatures and extreme temperature spikes. Plugging your intake or exhaust fan into a fan speed controller that will automatically increase or decrease the fan’s speed based your custom settings is fantastic to have. The more you can automate your grow room, the better. I cannot stress this point enough. There is no other time when a plant is more vulnerable to cold temperatures than when they are germinating and in the seedling phase. Plants can take an incredible amount of damage and live, but start touching the roots and you’re in for trouble. Seedling heat mats are used mostly for germinating as many plants need a soil temperature around 70 degrees Fahrenheit for the seeds to sprout. But don’t remove them just yet! Since seedlings have such a small root system, they can really benefit from their root system in their preferred temperature range until they develop. Electric heaters are a popular option for many indoor gardeners, and you can find horticultural specific heaters that are designed for the growing environment. Instead of adding an electric heater or turning your house’s thermostat up think about adding more lights. That is if you can. With HID, CHM, and top of the line LEDs, it easy to provide too much light to plants which can damage plants and reduce yields. Yes, your plants can be sunburnt. Nailing down your waterings & feeding, grow media, introducing CO2, temperature & humidity will lead to stronger plants that can tolerate more light. The reality is, temperatures are directly correlated to how effective your ventilation system is. If your grow tent doesn't have a simple ventilation system, your plants will suffer. Our complete grow tent kits come with a high quality ventilation system, making this a no brainer. If you have never set up a ventilation system before, don't worry. It is actually super simple. We detailed the process here in our grow tent ventilation guide!